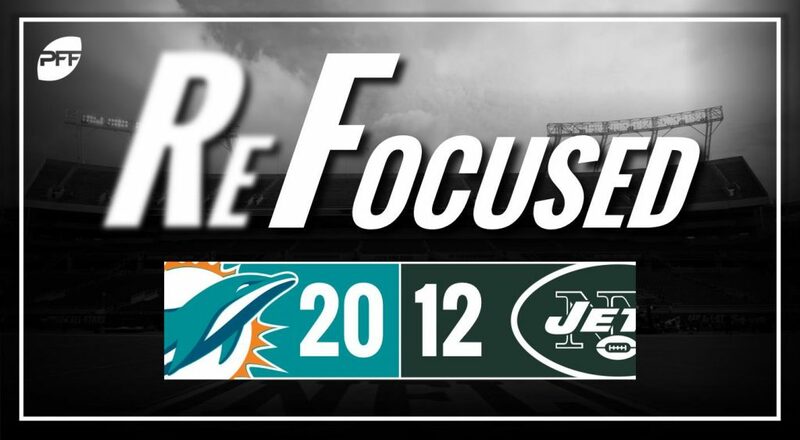 The Miami Dolphins defeated the New York Jets 20-12, continuing the second full week of action in the NFL. The box score numbers will look better than rookie Sam Darnold was in this game. Accuracy was an issue for the former Trojan, as was decision making at times, including a bad misread of coverage in the first quarter on a slant pass to Quincy Enunwa that was jumped and picked off by T.J. McDonald. It was a struggle for the interior of New York’s offensive line in this one. The trio of James Carpenter, Spencer Long and Brian Winters had a tough time handling the Dolphins’ defensive interior in the run game, leading to the Jets averaging just 2.2 yards per carry on the ground. And while they didn’t surrender a bunch of sacks, they consistently allowed the interior of the pocket to be pushed back, constricting the space their rookie quarterback had to operate. Leonard Williams once again demonstrated that he is a top-flight interior defender in the NFL. Williams was a terror among the Dolphins’ offensive line in Week 2, lining up in multiple spots and often winning against whomever he was matched up against. Williams was especially effective against the run, using his quicks and his strength to quickly shed offensive blockers in pursuit of the ball. The Jets shot themselves in the foot twice in this game with a couple of third-down sacks that resulted in Miami first downs due to holding calls in the secondary. The first came at the end of the second quarter when the Dolphins were driving with under two minutes to go; Williams and Avery Williamson were both able to get into the pocket to take Tannehill down, setting up a theoretical long field goal attempt. Morris Claiborne, however, committed a hold on the play, which allowed Miami to extend the drive, ultimately capping it off with their third touchdown of the half. The second instance came late in the third quarter when a Brandon Copeland sack was nullified by a Buster Skrine holding call. Fortunately for the Jets, they were able to take advantage of a fumbled snap a couple of plays later. The Dolphins were able to take advantage of some good field position early on to take themselves to a lead that was too much for the Jets to overcome. Despite his struggles, Tannehill was able to orchestrate an effective ground attack in the second half to stave off the New York comeback attempt. Ultimately, the Jets just couldn’t muster enough support for their rookie quarterback, fell behind early and Darnold wasn’t able to make the big throws downfield needed to compensate.